Sarah Thornton stands in the basement of the Frick Fine Arts Center, preparing for her work to appear in an exhibit Tuesday night. 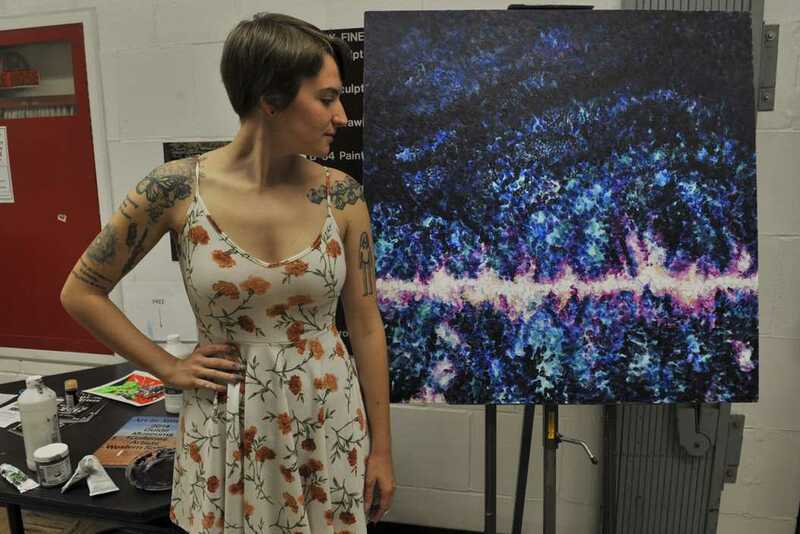 She dips her fingers in paint and presses them to the canvas, using gray and purple colors to put the finishing touches on her visual representation of the connections between physics, astronomy and the universe. “[I’m] connecting with the physicality of the material and subject matter,” Thornton, a former physics major and current senior studio arts student, said as she picked dried paint off her hands. The research of Professor Andrew Zentner — an astrophysicist who studies galaxy formation — inspired her art. Thornton was one of five students who collaborated with physics researchers for the second annual Artists in Residence program on Tuesday evening. Under the sky blue ceilings of the Frick Fine Arts Auditorium, musicians, poets and artists presented their interpretations of space and time. The program — which pairs humanities students with physics and astronomy researchers to create science-inspired art pieces — arose last year as a way to bring more depth and tangibility to physics, according to Professor Arthur Kosowsky of the physics and astronomy department. After a successful first year, the concept stuck. While the program application lists the option for students to work with a diverse range of physics researchers, this year’s group of participants coincidentally focused exclusively on astrophysics — an outcome that didn’t surprise Kosowsky. Five students collaborated with professors, including Kosowsky, over the course of the entire semester for the one night exhibit. “Throughout human history, astronomy has been very inspiring,” he said. Gabrielle Rajerison, a third-year English literature Ph.D. student, was amazed by the process of self-discovery that came through examining the universe through poetry. She collaborated with Professor Carlos Badenes, who studies the cycle of death and life of stars. “The deeper I got into it, [I realized] there was no bottom [to my learning],” Rajerison said, of her experience working with Badenes. Rajerison, who performed Tuesday, spoke softly into the microphone as she connected physics, astronomy and her love and life in “The Universe Offers No Conditional” and other excerpts from her longer poems. She was one of two poets who presented their work. Jessica Lanay Moore, also a graduate English student, took another approach in collaboration with Professor Michael Wood-Vasey. Wood-Vasey specializes in dark matter — an invisible source of mass — and uses modern computational methods to understand the expansion of the universe. Moore supplemented her poems with her own colorful, interactive graphics of constellations that she projected onto a vast white screen, drawing parallels between poets and astronomers. Violinists dressed in black, positioned behind a wall of silver MacBooks propped up by white cubes, brought an intergalactic experience to the event. Each musician wore headphones that played beats connected to a master clock. The beat incrementally doubled in speed while the instrumentalists listened and played to a separate rhythm. Kenneth Brown, a Pitt graduate music student, collaborated with Professor Jeffrey Newman to compose this piece for three violinists, titled “Simulation No. 1.” Brown considers the final product, which took a semester of work, an “amalgam” of astrophysics and music. The result was a harsh string symphony that was rooted in sonification –– the use of sound to represent complex data –– of Newman’s research. Brian Riordan, a fourth year Ph.D. student studying music composition and theory, presented a separate musical piece in collaboration with Kosowsky. Kosowsky himself is a musician and found the fusion of his cosmology research with sound to be appropriate. “The motions of planets are connected to music,” Kosowsky said. Riordan’s piece, “The First Wave,” was based on the concept of the cosmic microwave background — radiation leftover in the sky from the very early universe. The duo said the sound waves from 13.8 billion years ago can still be heard today, although some frequencies are more than 48 octaves below the range of human hearing. Riordan chose a bari sax, bass clarinet, and bassoon to emulate these deep, low sounds. He joined the musicians on stage with an electronic recording of cosmic microwave static, which rumbled through the auditorium. “The early universe was in tune with a B-flat,” Riordan said. By the end of the performance, the musicians, artists, and poets at the exhibit had all attempted to capture an aspect of physics that is not always present in the laboratory. For Thornton, using her fingers brings her closer to her art and allows her to interpret physics in a way that scientists cannot. “I think it’s hard to convey passion in [scientific] methodology ,” she said.